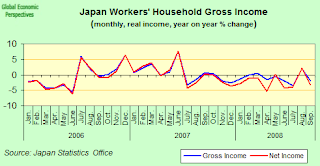 Well, suddenly Japan's economy seems to be back in the news. The BOJ today lowered interest rates, inflation seems to have peaked (and deflation may be once more looming on the horizon), householding spending is in decline, employment is falling, exports are languishing as the yen hits one high after another against both the dollar and the euro, Prime Minister Taro Aso is (despite the perilously large size of Japan's debt to GDP ratio) preparing yet another counter-recession spending package (this time of some $275 billion dollars, with $50 billion in additional spending), and yes, above all, Japan already seems to be mired deeply in recession. WITH luck rather than skill, Japan escaped the bubbles in housing, credit and commodities. As Western banks suffered, Japanese ones even went on a small acquisition spree. But the (fairly) good times are over. The unwinding of the yen carry trade, in which investors borrowed low-interest yen to place in higher-yielding assets abroad, has helped to send the yen soaring (see chart). Exotic foreign-currency products sold to retail investors reinforce the currency's upward trajectory. The stronger currency threatens the profits of Japan's big exporters, contributing to a stockmarket rout, which in turn is winnowing Japanese banks' capital. To alleviate the woe, the Bank of Japan was expected to cut interest rates from 0.50% to 0.25% on October 31st. But the economy will still get walloped. Personally I would say - and despite the venerable opinions of the Economist - that there was nothing either especially "lucky" or even "exotic" here - if you look carefully you will find that the similarities with what is happening in Germany are absolutely striking. Both countries have a very high populationmedian age (43), both have congenitally weak internal demand (no credit expansion driven housing booms here), both are thus completely dependent on exports (with GDP growth folding in rapidly as world trade growth comes to a halt), and both escaped the domestic lending driven banking problems being faced in the US, the UK or Spain, bygenerating an external lending driven ones - since they lent out in large quantities the precious fruits garnered from many hard years working to create very large current account surpluses. Now put that in your pipe, and go smoke it. The Bank of Japan cut its benchmark interest rate today to 0.3 percent - in a split decision with Governor Masaaki Shirakawa casting the deciding vote. The key overnight lending rate was thus lowered from 0.5 percent - the first rate reduction in seven years - after four of the eight board members voted "no", according to a statement from the central bank in Tokyo this morning (Friday). Shirakawa had been under considerable pressure to lower borrowing costs after the Nikkei 225 Stock Average slumped to the lowest level since 1982, with widespread concern that the global financial crisis will only serve to deepen Japan's current recession (the economy declined at a 3% annual rate in Q2, and a further contraction in Q3 is more or less guaranteed. Until today, the bank had held rates steady even while other central banks across the globe cut, arguing that Japanese rates were already "very low". Now, with the US Federal Reserve Rate at only 1% (and Ben Bernanke rumoured to be making contingency plans for a Japan style ZIRP for the US) they do not seem to be that high. Board members Miyako Suda, Atsushi Mizuno, Seiji Nakamura and Hidetoshi Kamezaki, all of whom have private sector backgrounds, voted against the decision. The central bank also cut back its growth forecast for the financial year ending March to 0.1 percent - from the 1.2 percent which was still being predicted as recently as July. The bank also altered its inflation forcast, arguing that inflation will continue to fall next during the next fiscal year. The bank forecast assumes that core consumer prices will rise 1.6 percent in the current fiscal year and remain stationary in the following 12 months. This looks very optimistic to me, and I think we are soon headed back to deflation territory (see argument below) - prices month on month were already more or less stationary between August and September, and the so called core-core index has only been positive on an annual basis during the last 4 months out of the 32 since January 2006 (when my records stop). The central bank also decided to begin paying interest on reserves commercial lenders hold at the bank to provide liquidity to the financial system and trimmed the Lombard rate - the cost it charges for loans made directly to member banks - to 0.5 percent from 0.75 percent. Before today, Shirakawa and his board had given no indication they planned to cut borrowing costs, other than to say that policy was "flexible". Even following today's decision policy makers do not seem comfortable with the situation they find themselves in, and warned that `"from a longer-term perspective" keeping borrowing costs low for too long "may lead to larger swings in economic and financial activity as well as in prices". Well, as Keynes also warned in the longer term perspective the only thing we know for sure is that we are all dead, and in the meantime I suggest it will be many a long day before we see the risk of that excessive asset bubble the BoJ seem to live in such fear of. Downside risks, recession, deflation and sustainability of the government debt dynamics seem to be much more to the point at the moment. 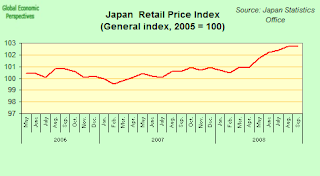 Inflation Stationary, When Do We Officially Get To Declare Japan Back IN Deflation? Consumer prices excluding fresh food climbed 2.3 percent from a year earlier, after rising 2.4 percent in August, the statistics bureau said today in Tokyo. But if we look at the core core index (which strips out both energy and fresh food) then we can see that it has been completely flatlining over the last twelve months, and with a very large capacity overhang now developing, this index will almost certainly get back into negative territory very soon. Even the general index (which includes both food and energy) has now screeched to a halt (as energy prices plummet), and was stationary between August and September, as can be seen in the chart below). The index currently stands at 99.6 (on a 2005 base of 100) and only really need to fall about 0.2% (which is sure to happen over the next couple of months I think) for us to be safely tucked back once more under the beloved deflation safety blanket, an eventuality which seems not to preoccupy the BoJ in the least. Household spending fell for a seventh month in September, with overall household spending falling 2.3 percent year on year in price-adjusted real terms. Compared with August (on a seasonally adjusted basis), spending was up 1.7 percent. 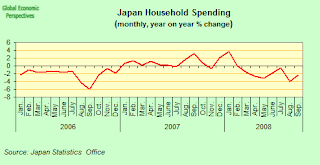 The average Japanese household spent 281,433 yen ($2,856) in September according to data from the Ministry of Internal Affairs and Communications. Spending by wage earners' households fell 3.4 percent in September from the same month a year ago. 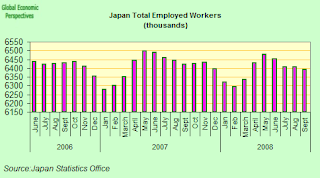 Unemployment in Japan decreased slightly in September, according to government data also out today (Friday).The seasonally adjusted jobless rate hit 4.0 percent, down from 4.2 percent in August. 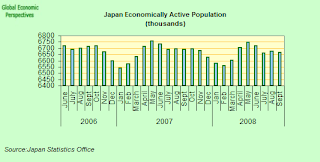 Many economists are confused by this - since they had forecast the jobless rate to stay at 4.2 percent - but they seem to be forgetting (yet one more time) to factor in Japan's ageing population ingredient, which means that the 15 to 75 population is now in slow decline, and that as employment conditions worsen normally see a withdrawal of people from the labour market rather than into unemployment. So unemployment may well rise in the months to come, but not necessarily by that much. September's jobs-to-applicants ratio was 0.84, so there were only 84 available jobs for every 100 applicants. This was the lowest figure was since August 2004, and down on the 0.86 level reported in August.The government also said the number of new job offers decreased 13.4 percent from a year earlier - in fact there was a 21.3 percent year on year decline in August. The number of people in the workforce shrank by 200,000 from August, and this drop was obviously the key factor behind the decline in the jobless rate. The number of people employed was also down - by 110,000 - and this was the fourth drop in five months. Finally Prime Minister Taro Aso decided yestreday to postpone the national election that polls suggest could have seen him and his ruling LDP party being pushed out of power. He also announced an "economic revival" package, worth an estimated $275 billion, of which $50 billion would come from new spending (and the quantity of new money needed would undoubtedly have been higher if the BoJ had not "conveniently" cut interest rates today. The details we have so far on the package suggest it is set to give large tax breaks to home mortgage holders, extend tax cuts for capital gains, lower highway tolls and give loans to small businesses. And before we talk about Japan's economy being finally "cured", it may well be that we need to get through to a once and for all thorough diagnosis of the problem. So I will juts leave you with two more charts. 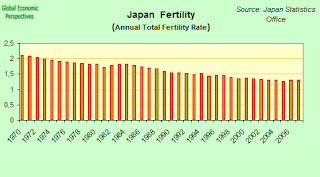 The first of these is the one showing Japan's long term low fertility problem. 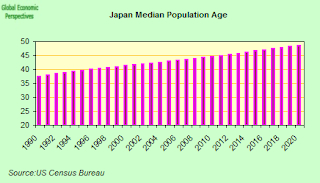 And the other is the one showing the steadily rising population median age which this produces. Now, with Japan government debt to GDP currently standing at 182% (according to OECD data), we might like to ask ourseleves just how many times Japan can spin round on this merry-go-round (remember we are now back effectively in 1998, but with a much higher debt to GDP) before the spinal axis finally snaps (or something worse happens). The latest package will only send debt to GDP even higher, and probably we will see more of the same in 2010. So is the sky really the limit here? Or will someone one day finally prove willing to take the bull by the horns, accept that what is happening actually is happening, and start to do something about it. The Japanese government last week acknowledged Japan has probably entered its first recession in six years as exports, production and spending slow. And who am I to disagree with them. 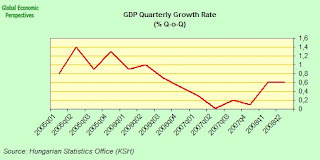 Now onwards and downwards we go to the coming Q3 GDP release. The Bank Bailouts Are Very Well Intended, But Where Is All The Money Going To Come From? As every woman who has ever had dealings with a man knows only too well, it is a lot easier for people to make promises than it is for them to keep them. And when Europe's leaders met in Paris on the 12 October, a lot of fine promises (which were all, surely, very well intentioned) were made. The reality of having to live up to them, however, is turning out, as might only have been expected, to be much more complicated. Basically, the kernel of the plan which is now being operationalised seems to have been thrashed out in Washington on 11 October, when key G7 leaders met with Dominique Strauss Kahn of the IMF, and it was decided to try and erect two great firewalls (corta fuegos) - at least as far as Europe is concerned. One of these was to be co-ordinated by the EU governments, and the other by the IMF, who were to act in the East. Both these parties essentially agreed to guarantee the banking systems in the countries for which they took responsibility, so the action, in a sense, moved from the banks (which are now, more or less "safe") to the governments and the IMF (who is ultimately backed by cash from governments), and it is the "safety" of these institutions which is likely to be more or less tested by the markets, with the first trial of strength taking place right now in Iceland. So the big question now is, do these various institutions have the resources to back up their guarantees, should the need arise? In this context the Financial Times had a very interesting article yesterday about the fact that the Austrian government had decided to cancel a bond auction. Austria, one of Europe’s stronger economies, cancelled a bond auction on Monday in the latest sign that European governments are facing increasing problems raising debt in the deepening credit crisis. According to the FT article the difficulties Austria, which has a triple A credit rating, is facing only serves to highlights the extent of the deterioration in the sovereign bond market, where benchmark indicators of credit risk such as the iTraxx index hit fresh record spreads yesterday. Austria now is the third European country to have cancelled a bond offering in the last few weeks - in the Autrian case the markets are getting more and more nervous over the exposure of some of its key banks (Erste, Raffeison) to the mounting disaster over in Eastern Europe - both Hungary and Ukraine received IMF loans this week (see below) and they certainly won't be the last. Austria seems to have dropped its plans for a bond launch next week due to the size of the premiums (spreads) investors seemed likely to demand, although the Austrian Federal Financing Agency did not give any explanation for the decision. Spain, which alos currently has a triple A rating, and Belgium have both cancelled bond offerings in the past month because of the market turbulence, with investors again demanding much higher interest rates than debt managers had bargained for. So really many European governments are now facing similar problems to those their banks faced earlier, they can get finance, but only at rates which they consider to be punitively high (remember, the interest has to be paid for from somewhere, in the present recessionary climate from cuts in services more than probably, since, remember, if we look over at Eastern Europe, investors are very likely to "punish" those governments who try to go down the easy road, and run large fiscal deficits over any length of time). Market conditions have steadily deteriorated in recent days with the best gauge to credit sentiment, the iTraxx investment grade index, which measures the cost to protect bonds against default in Europe, widening to more than 180 basis points, or a cost of €180,000 to insure €10m of debt over five years, on Monday. This is a steep increase since only as recently as Monday of last week, when the index closed at 142 base points. Also the cost of default protection on European companies has risen to record highs this week on investor concern that the global economic slowdown will curb company profits. The Markit iTraxx Europe index of 125 companies with investment-grade ratings fell 3.5 basis points yesterday to 166.5, after hitting a record high on Monday. The FT cites analyst warnings that the there is now a huge quantity of government debt building up in the pipeline, and the government bonds due to be issued in the fourth quarter and early next year will only add to the problems some countries are facing, and particularly those countries like Greece and Italy who already carrying large amounts of debt that needs to be refinanced or rolled over. It has been estimated that European government bond issuance will rise to record levels of more than €1,000bn in 2009 – 30 per cent higher than 2008 – as governments seek to stimulate their economies and pay for bank recapitalisations. The eurozone countries will raise €925bn ($1,200bn) in 2009, according to Barclays Capital. The UK, which is expected to increase its bond issuance from the current €137.5bn in the 2008-09 financial year, will take the figure above €1,000bn. Italy, and Greece, both with a debt-to-GDP ratios of over 100 percent, are certainly the most exposed to continuing difficulties in the credit markets, (with analysts forecasting that Italy alone will need to raise €220bn in 2009). At the present time the Libyans are lending the Italian government a helping hand (and here) in struggling forward, but even oil rich Libya doesn't have the money to fund the long term needs of the Italian banking, health and pension systems. On the other hand Bloomberg had an article yesterday on the growing pressure on the IMF's somewhat limited resources, as one country after another in Central and Eastern Europe joins the "consultation queue" in the hope of getting a bail out. Bloomberg report that the cost of default protection on bonds sold by 11 emerging-market nations has now either approached or surpassed distress levels, raising the very immediate likelihood that the International Monetary Fund's ability to bailout countries may soon start to be put to the test. Credit-default swaps on eight countries including Pakistan, Argentina and Russia have now passed the 1,000 basis points mark, the level which is normally considered to signify "distress", according to data provided by CMA Datavision. Funding one basis point on a contract protecting $10 million of debt from default for five years is equivalent to $1,000 a year. Ukraine, Hungary, and Iceland have already received IMF loans, while the fund is currently in "consultation" talks with Belarus, Turkey, Latvia, Serbia, Romania, Bulgaria and Pakistan, at the very least. According to Simon Johnson, former chief economist at the fund the IMF only has up to $250 billion it can currently lend (as quoted in the Financial Times yesterday). Credit-default swaps on Pakistan currently cost 4,412 basis points. Contracts on Argentina are at 3,650 basis points, Ukraine at 2,850, Venezuela at 2,400 and Ecuador costs 2,072. Default protection on Russia, Indonesia and Kazakhstan also costs more than 1,000 basis points, while Iceland costs 921, Latvia 850 and Vietnam 837. Contracts on Turkey cost 725 basis points. The IMF agreed at the weekend to lend Ukraine $16.5 billion for 24 months and stated yesterday that they would contribute $12.5 billion towards a $25.5 billion loan for Hungary (with the other participants being the EU and the World Bank. Iceland got a $2 billion loan on Oct. 24 and Belarus has asked for at least $2 billion. Just how many more loans are now in the pipeline, and if the IMF does start to see its funds stretched, just who exactly is going to step up to the plate and fork the necessary money out? The sheer fact that they only put part of the cash for the Hungarian loan, and that the World Bank had to come on board with a symbolic $1 billion shows they are already aware that the problem may arise. Well just after writing this, I see from reading the FT that Gordon Brown got there just before me. Beaten by a short head! The prime minister on Tuesday urged the oil-rich Gulf states and China to provide "substantial" funding to the International Monetary Fund, before flying to France for talks on an increase to the European Union's bail-out fund. The government is keen to emphasise the link between global action and domestic voters' interests, as well as portraying Mr Brown as a world leader. The prime minister said it was "in every nation's interests and the interests of hard-working families in our country and other countries that financial contagion does not spread". While he did not rule out the UK making a contribution, he insisted the "biggest part can be played by the countries that have got the biggest [balance of payments] surpluses". The IMF's $250bn (£158bn) bail-out fund "may not be enough" to prevent the crisis destabilising more countries, Mr Brown said. His spokesman added the UK was "looking at a figure in the hundreds of billions of dollars" for the IMF. Mr Brown called for "action on this new fund immediately". Also, another story in Bloomberg gives us a further glimpse of how the EU governments are planning to do all that financing. The German government, it seems, is going to print IOUs (sorry, bonds) and give them directly to the banks. That is, they are not going to auction bonds and give the proceeds, they are simply giving the paper, and presumeably paying a coupon (or interest). Oh yes, and the bonds will not be sellable, since this would, of course, damage the yield curve via the supply and demand process, but they will count as debt, which means that the German government is being very naieve here (assuming the report is accurate) since of course the rise in the debt may well mean a breach of the 2011 balanced-books commitment, and falling back on this will almost inevitably have an impact on the extra implied risk investors will be looking to get paid for holding the bonds. Germany plans to finance part of its 500 billion euro ($636 billion) bank rescue package by issuing bonds to banks in exchange for new preferred stock, according to Finance Agency head Carl Heinz Daube. Germany's rescue plan, approved by lawmakers on Oct. 17, amounts to about 20 percent of the gross domestic product of Europe's biggest economy. Chancellor Angela Merkel's administration pledged 80 billion euros to recapitalize distressed banks, with the rest allocated to cover loan guarantees and losses. ....Hypo Real Estate Holding AG, the Munich-based lender that's already had a 50 billion euro bailout, today asked the Deutsche Bundesbank for 15 billion euros to cover short-term liquidity needs. ....Frankfurt-based Deutsche Bank AG may also need 8.9 billion euros of new capital, more than any bank in Europe, Merrill Lynch & Co. analysts Stuart Graham and Alexander Tsirigotis wrote on Oct. 20. The bailout plan is still being discussed in Berlin and more information will probably be released at the end of this week, Daube said. Germany may meet additional funding needs for its bank rescue by selling six-month bills before examining options for borrowing using longer-term securities, Daube said. The government plans to offer between 212 billion euros and 215 billion euros of debt through its 2009 program, about the same as the 213 billion euros scheduled for this year. The debt-for-equity swap will probably have ``next to no effect'' on the country's yield curve because the notes offered to banks won't trade in the so-called secondary market, he said. The yield curve plots the rates of government bonds according to their maturities, and increases indicate higher borrowing costs. Gentlemen, we are out of our depth here. As Ukraine And Hungary Accept IMF Loans, Will Poland Be Next? Yesterday, the Ukraine received a USD16.5bn loan from the IMF and the IMF at the same time said that it would agree with the Hungarian government on a rescue package in the coming days. Under normally circumstances this would be good news for CEE assets. However, it seems like the markets are totally giving up on CEE. 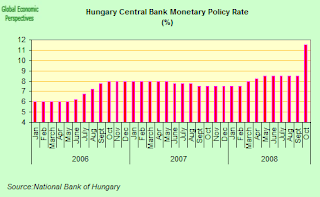 This morning the Hungarian stock markets have dropped more than 10% despite the promise of an IMF package. ......it is worrying that the CEE markets continue to sell-off despite IMF’s clear commitment to support the region’s markets and economies. One might in fact see the lack of positive response to IMF’s rescue packages for Hungary and the Ukraine as an indication that these packages are in fact making the markets even more nervous that something “is seriously wrong in CEE”. Central European stocks declined for a fourth consecutive day on Monday, with indexes in Vienna and Budapest heading for record monthly drops, as concern mounts that the global financial crisis is going to have a severe impact on economic growth across the entire region and amidst worries that the IMF sponsored rescue packages in Hungary and Ukraine simply won't be sufficient to avoid the worst of the damage. Concern is also mounting that there will be a process of "contagion" which will affect the whole region, and hence what we are now seeing is mounting pressure on financial systems across the CEE including, surprisingly perhaps, the Polish one. I say surprisingly, since Poland's economy is normally thought to be rather stronger than most in the CEE and especially than those of countries like Latvia, Lituania, Estonia, Bulgaria, Romania, Hungary, Ukraine, Belarus and Serbia, all of whom are currently in negotiations of some kind or another with the IMF. Thus, we might be forgiven for thinking quietly to ourselves "if Poland falls, then god help the rest of them". Erste Group Bank AG slid to the lowest level in more than five years while Raiffeisen International Bank Holding AG, which operates in Russia and the Ukraine, plunged after mounting financial chaos forced Ukraine to seek help from the IMF. 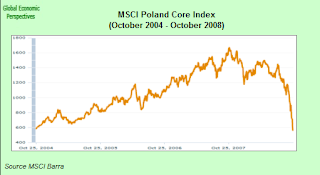 Against the general trend Poland's WIG20 Index added 2.2 percent on the day, but this did follow a 5.9% fall on Friday. The MSCI Barra Core Poland Index (which is a measure of comparative equity values) is down 48% so far this month, and 61.24% over the last three months. The Polish government also announced on Monday that Poland is considering guaranteeing interbank transactions - according to Deputy Prime Minister Waldemar Pawlak speaking on Polish public radio. Pawlak said that the government is examining the possibility of taking bank shares as collateral in exchange for any guarantees offered. According to Pawlak external investors in Polish banks have been applying policies that are "too strict" in the Polish context, since the credit problems encountered elsewhere have not affected Polish banks in the same fashion. This is a classic example of what we economists call "contagion". According to the draft of the new law which is set to go before the Polish cabinet on Tuesday, Poland's government will be empowered to guarantee commercial banks loans from the central bank and other lenders on the interbank markets. The government will also be able to lend cash and state securities to banks. Poland's central bank has already injected 9.3 billion zlotys ($3.42 billion) of liquidity into the banking sector (last week), in the form of 14-day repos. The latest decision seems to have been taken in order to try to ease strains on the Polish money market, and in particular the availability of forex loans. Poland's deputy prime minister also issued a warning that local bank capital was at risk of capital being transferred to financially-strapped foreign banks who own the local banks and urged the country's financial watchdog to stay vigilant in the face of this. Here we see the reverse side of the coin of having non-national banks in such a dominant position. Previously this was thought to be a great advantage, since the parent banks were thought to be ready willing and able to fund domestic lending almost ad-infinitum. Now we see that this is not at all the case, and that their behaviour moves in a pro-cyclical direction, exaggerating the boom in the good times, and sharpening the downturn in the bad ones. "There is a risk that the capital will be transferred from Polish institutions to their parents," Waldemar Pawlak, who is also the economy minister and heads the governing coalition's junior party, was quoted as saying by PAP newswire. As a consequence of this governmental concern the Financial Oversight Commission (KNF) has asked banks domiciled in Poland to report all transactions with their foreign owners on a daily basis. KNF head, Stanislaw Kluza, said in a newspaper interview last week that the he considered the risk of capital transfers to be very low, however, because the European banks Polish outlets, with only $284 billion in total assets, were much too small to rescue large players in Europe and the United States. This is evidently true, but some of these foreign banks are now under great pressure to avoid additional exposure in the East, and a rapid withdrawal (or ceasing up in the flow) of funds could equally correspond to just this kind of damage limitation strategy. Foreign financial groups, among them Italy's UniCredit, the Dutch ING Groep, and KBC Group NV, Belgium's biggest bank and insurer by market value (all of whom are struggling with major problems at the present time), control two-thirds of the Polish banking sector after buying stakes in local lenders during the banking sector privatisation of the 1990s. Polish lenders have been especially hurt in recent weeks by concerns over their ability to obtain foreign currency through interbank markets and worries about the fate of their foreign parents. Executives at some Polish banks have urged the government to consider introducing guarantees after the central bank's moves to boost liquidity on the interbank market, including foreign exchange swaps, failed to boost confidence between lenders. The financial watchdog KNF said on Saturday that Poland should think about measures to boost the Swiss franc positions of Polish banks, along with guarantees of interbank transactions or an eventual "institutionalisation" of the interbank market. But the regulator, the government and central bank insist Polish banks remain solvent and enjoy "over-liquidity." Many of Poland's banks, like other lenders in the region, have been forced to introduce severe curbs on mortgages in Swiss francs due to pressure on their own liquidity and balance sheets. Such lending had become popular in Poland in recent months due to lower interest rates available from Switzerland and what was once favourable exchange rate. Millennium BIGW.WA and PKO BP PKOB.WA, two of Poland's top home loan lenders, have gone so far as to announce that they were going to tighten rules for new mortgages due to the rising cost of money and fears that global financial nervousness may lead to much slower economic growth in Poland. Millennium Chief Executive Boguslaw Kott said last week that the group - which is Poland's third-biggest mortgage lender would ask for a 35 percent downpayment for popular Swiss francs-denominated home loans, a move which is likely to put a sharp brake on the growth of its mortgage portfolio. PKO, Poland's largest mortgage lender, also confirmed it would ask new clients to put up 20 percent of the value of property when borrowing in francs. Millennium, which is controlled by Portugal's Millennium bcp, will now also require customers to cover 20 percent of investment when borrowing in Polish zlotys. Both banks had previously been offering mortgages equal to the entire value of the new home (100 LtV). Basically, what the hell these people thought they were doing by continuing to lend at 100% LtV after we have seen all that has happened in the US, and that is now happening in the UK and Spain is totally beyond "my ken", it really is. Chief Executive Boguslaw Kott described the move as a precautionary one, and said it did not reflect any liquidity problems, adding that it was now more difficult to get Swiss francs on the interbank market. Marek Juras, head of research at BZ WBK brokerage is quoted as saying: "At times like these it is more important for banks to take care of their liquidity than drive their sales even higher." He estimated that for some lenders this would translate into a drop in new mortgages by between one-third and one-half. The two market leaders join other smaller lenders, which in recent days moved to raise the bar for mortgage lending in foreign currencies as banks become more conservative and try to lure more cash on deposits by offering even higher yields. Mortgage adviser Expander said Getin's DomBank and Santander and GE Money had tightened their lending requirements. Many banks have also boosted margins on their mortgages in the past two weeks. The Polish mortgage market has expanded rapidly since 2003, driven by economic growth and soaring wages, with annual growth exceeding 40 percent in the first half of this year. 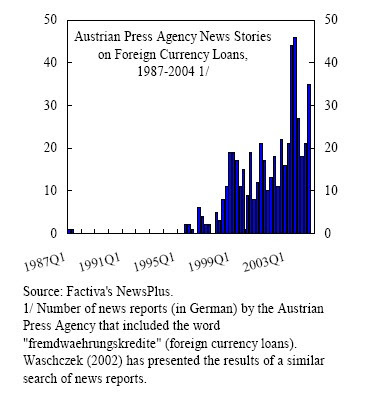 Large numbers of central and Eastern European housebuyers hold loans in foreign currencies, especially Swiss francs. Most major Austrian banks, including UniCredit's Bank Austria, Erste Group Bank and cooperative Raiffeisen have now completely stopped lending to Polish domestic retail customers in foreign currencies. After a meeting with economic advisers President Kaczynski advised Poles to keep faith in the zloty as the currency suffered further setbacks on the markets on Friday. Kaczynski recommended that loans should be taken in zlotys, not foreign currencies in order to avoid losing money on currency exchange. President Lech Kaczynski told a press conference last Friday. Seventy percent of the Polish banking sector is owned by foreign banks leading to concern that the impact of the general crisis in the banking sector will be felt in Poland. On Tuesday, Polish business Daily, Gazeta Prawna wrote, "The global financial crisis may cause large shifts in the Polish banking sector, AIG Bank Polska will soon be sold and there has been speculation that Fortis, Dominet, Citi Handlowy and even Bank Pekao may change hands." Sell off speculation has surrounded the Italian owned Pekao bank over the last two weeks. It was subject to a 20 percent share price decrease in October prompting concerns that owner UniCredit may have been considering selling of all its Central and Eastern European assets. 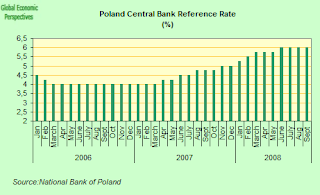 This has since failed to materialize but shows the current lack of faith surrounding the Polish banking sector. Slawomir Skrzypek, president of The National Bank of Poland stated it had no intention of stepping in to help the zloty as it continues to weaken on the foreign currency market in a statement to reporters on Friday. The sale of apartments in Poland has dropped by 70 percent in comparison to the same time last year, showing that the credit crunch is beginning to bite in Poland. The tightening of lending policies by banks has caused demand to fall and though prices are decreasing by 10 to 20 percent in some areas, buyers are looking for smaller flats, or withdrawing from the transaction altogether. The financial crisis has also influenced the situation of those clients who wanted to buy apartments without needing to get a mortgage, the number of which is declining due to losses on the stock market, says Gazeta Prawna. Polish banks are to crack down on credit lending for housing loans after Poland’s financial regulator asked them to get tougher on lending practices. Millennium bank is one of the first high street banks to react and will now expect customers to cover 35% of the loan if they borrow in a foreign currency or 20% if borrowing in Polish zloty. The move is thought to be a precautionary one and not an indication of any liquidity problems, according to CEO Boguslaw Kott who told a news conference on Tuesday, “The decision practically blocks an increase of our mortgage portfolio.” He also told reporters that Swiss francs are harder to come by on the interbank market. Millennium Bank has been a dominant force in the Polish housing lending market with 80% of its mortgages being in Swiss Francs. This reflects a trend across Central and Eastern Europe where many house buyers have loans in either Swiss or other foreign currencies. PKO BP, another major Polish mortgage lender, has joined Millennium in reducing credit offered to 80% of the value of the property. Fears that the Polish housing market could suffer a similar fate to that in the Baltics, or Ireland, or the UK (with all the consequences for the bank balance sheets) are as yet premature, but the move does indicate a heightened degree of nervousness and uncertainty on the part of some of the biggest hitters in the Polish lending market. 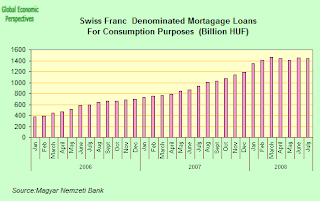 "We are extending between 35 and 60 million zlotys worth of mortgages each day, the vast majority of those in Swiss francs." Mariusz Grendowicz Head of BRE Bank BREP.WA is quoted as saying "To fund our growth in mortgages, we were the only bank to the best of my knowledge that was not using swaps, which were the cheapest alternative, but actually taking out a three- to four-year loan in Swiss francs to fund the book,"
The impact of the seize up in Swiss Franc housing loans is hard to guage at this point, although all the indications are that it will be serious. Foreign currency lending has not been such an important phenomenon in Poland as it has been in other CEE countries, but its weight has been growing in the last 18 months or so (see chart below). 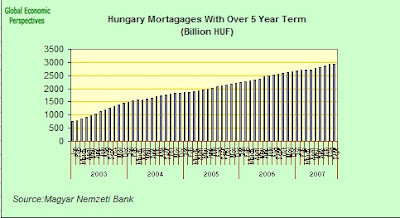 The role of forex lending is clearly more important in housing loans than in general lending (see chart below). One of the reasons for the recent uptick in Swiss Franc lending has been the monetary tightening cycle initiated by the central bank (see chart below), which made the cheaper interest rates available in CHF more attractive even though there was an evident currency risk involved. 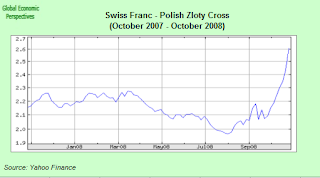 If we look at the next chart the year on year rate of increase in the forex loans (the Polish central bank don't distinguish in their data between CHF and Euro, but all the anecdotal evidence cited above points to a significant role for the CHF, and especially given the role of Austrian banks were this type of lending has been commonplace. The big problem is really that the CHF is a "carry trade" currency, and carry currencies have a strong tendency to shoot up in value as risk sentiment retreats, quite simply because people all try to liquidate their positions at the same time. Hence carry currencies have a kind of "pro-cyclical" role, adding to the boom during the good times, and making the bad times even worse. Which would be one very good reason why if you really do want an fx mortgage, using a currency other than a carry one would be a good idea. Obviously those who have euro denominated mortgages - while not being immune from the present problems (see the Baltics) - are less exposed, since the movements in the relative value of the euro tend to be in the opposite direction to those of the CHF and the Japanese yen. Well obviously Polish GDP growth is now set to slow quite dramatically. At this point just how dramatically is hard to see. Credit Suisse Group recently cut its forecast for Polish economic growth next year, predicting that the global financial crisis will hurt consumption and investment. Credit Suisse said Poland's gross domestic product will rise by less than 4 percent in 2009, compared with the 4.4 percent rate it had previously forecast. The Credit Suisse revision, coming as it did amid rising risk aversion in the emerging markets context, pushed the zloty to a two-year low against the euro when it was released, which gives us some indication of just how nervous people have become. I think, basically, even Credit Suisse are being over optimistic at this point, although I think we need to see some more detailed real economy data before we can start putting serious numbers on just how over-optimistic they may be. Poland's "private consumption and investment should fall further than we had anticipated due to our expectations of an increasingly restrictive credit environment in 2009,'' Jacqueline Madu, an emerging-markets research analyst at Credit Suisse in London, wrote in the note. One of the first areas where we should expect this current crunch to be felt is in construction activity itself. 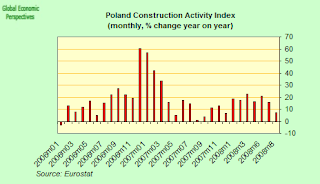 There is no doubt that Poland has been "enjoying" the fruits of a construction boom since the second half of 2006. It seems to have come in two "waves" if we look at the chart below, with the first wave being much stronger than the second one. If we actually look at the level of the seasonally adjusted index, then the steep increases in the levels of construction output become apparent. We should also notice how since about April 2008 the level has more-or-less stopped rising, and this seems to suggest that the construction expansion had been slowing even before the latest credit shock. So I think we should all be ready for this easing up in the expansion to be followed by a sharp slowdown in the weeks and months to come. 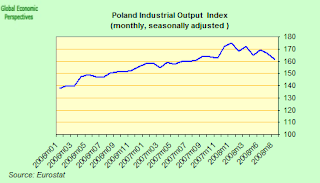 Also, if we move beyond construction and look at the chart for year on year industrial activity (see below), then it is clear that the expansion in Polish industrial output has been fading for some months now - not a good sign, not good at all, since it means that there is little underlying stability to resist the knock. The thing is running out of energy. This becomes even clearer when we look at the seasonally adjusted index, since it is pretty evident that industrial output went into decline at the end of last year, killed-off in part by the high zloty, and in part by excess internal wage and cost push inflation. So all in all, we should now be advising people in Poland to fasten their seat belts, since the ride may get bumpy. It is not clear at this point whether things will actually go so far as to need an IMF intervention in Poland, but with contagion spreading rapidly across the region, and Italian and Austrian banks visibly wobbling, it is a possibility which is not at all excluded. 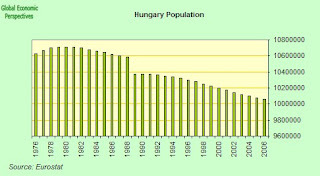 Hungary announced on Sunday that it had reached agreement with both the International Monetary Fund and the European Union on a broad economic rescue package, which will include substantial financing, in a bid to stabilize a Hungarian economy which has been both shaken by the global financial crisis and faces long term macro economic and structural problems which make any easy solution to the situation hard to expect. "A substantial financing package in support of these strong policies will be announced when the program is finalized in the next few days," IMF Managing Director Dominique Strauss-Kahn said in a statement that did not indicate the size of the package. 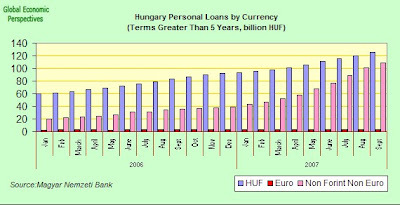 Hungary announced the loan at more or less the same time as Ukraine received a USD16.5bn loan from the IMF. Under normal circumstances both these moves would be good news for Central and East European equity markets assets. This was not the case on this occassion, however, and Hungary's stock markets fell more than 10% on opening yesterday, suggesting that either investors are not convinced the packages will be sufficient, or that they fear there is more to come. “The latest flash PMI indicates the alarming extent to which the financial crisis has developed rapidly into an economic crisis, with the Eurozone economy contracting at the fastest rate for over ten years in October. Manufacturers are the hardest hit, with the sector contracting at a pace exceeding even the most pessimistic of forecasts polled by Reuters. Chris Williamson, chief economist at Markit. The eurozone economy continued the contractaction registered in the third quarter in October at a speed not seen since the start of the euro in 1999, with the kock-on effects of the global bank crisis hitting manufacturing industry especially hard, and making a huge dent in industry’s order books.These are the grim conclusions which can be drawn from the latest - Flash - Purchasing Manager Index (PMI) readings for the economies of 15-country currency zone. The low readings registered are provisional, but experience shows that they are unlikely to be that far off the mark, and they obviously make even more likely substantial cuts in European Central Bank interest rates over the coming months, especially since price pressures also cooling rapidly as overcapacity issues yawn before us. The results only serve to add to concern that the recession which the eurozone in all likelihood entered on April 1 2008 that will prove to be a long drawn out and protracted affair. The Markit Flash Eurozone Composite Output Index sank to a new record low in October, signalling the steepest monthly reduction in private sector output since the survey data were first compiled in July 1998 and the fifth successive monthly contraction. Output fell at a new record pace in manufacturing, while services activity showed the second-sharpest deterioration ever recorded, with the decline exceeded only by that seen in October 2001. Expectations of business activity in 12 months' time in the service sector plummeted and hit a new record low - and by a wide margin. Falling output and business confidence were linked to a record monthly drop in demand for goods and services, as measured by the composite new orders index. Overall, new orders have now fallen for six consecutive months. 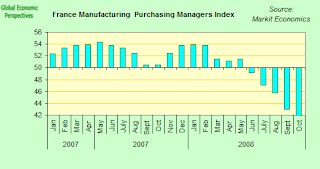 The “composite” purchasing managers’ index, covering manufacturing and services, slumped from 46.9 in September to 44.6 in October, the lowest since the survey began in July 1998. A figure below 50 is taken to indicate a contraction in activity. Eurozone manufacturers’ new orders fell at the sharpest rate recorded, led by a slump in export orders. Service sector new business did not contract as fast but still saw the second steepest fall on record. We only have a breakdown of country secific indices for France and Germany, and French manufacturing is evidently performing a lot worse than its German equivalent, although the contraction in German industry is getting sharper by the month, and anecdotal evidence does suggest that there may be much worse to come as demand from the very important customer base in Eastern Europe comes virtually to a dead stop in the wake of the credit crunch. So even Germany saw private-sector output contracting for a second consecutive month, and business sentiment for the next 12 months sank to the lowest level registered there since records began in June 1997. The composite reading for manufacturers' new orders fell at the steepest rate yet registered by the survey, led down by a record fall in new export orders. In comparison, new business in the service sector showed a more modest rate of decline, though still posted the second largest contraction yet seen by the survey. Input price inflation, on the other hand, having hit a near-eight-year high back in July, eased back again for the third successive month in October, dropping to the weakest pace since July 2005. The monthly fall in the rate of price increases was the sharpest ever recorded by the survey, led by a steep easing in manufacturers' input price inflation, which in turn reflected lower commodity prices and an increased willingness among suppliers to cut prices to sell stock. Input cost inflation also moderated in the service sector. Output prices rose only slightly during the month, the rate of increase having slowed for the third successive month from July's record high to reach the weakest since December 2005. Upwards pressure on charges was alleviated by weaker growth of input costs, but also reflected discounting in the face of falling demand. 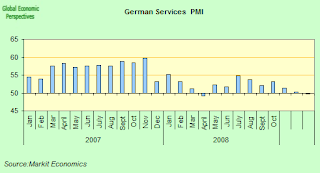 The rate of expansion in the German economy dropped back to its lowest level in more than five years in October. The preliminary flash estimate of the composite purchasing managers' index for what is the euro zone's biggest economy fell to a 64-month low of 46.7 in October from 48.5 in September. Manufacturing activity in contracted for the third straight month with the reading plunging to 43.3 from a final reading of 47.4 in September. French manufacturing activity contracted at its fastest pace in a decade in October, while new orders in both manufacturing and services fell at their sharpest pace in 10 years. The flash estimates of the Markit/CDAF PMI showed the headline figure for manufacturing fell to 40.8 in October, its lowest since data was first collected in April 1998, from 43.0 in September. The services sector, which accounts for around two-thirds of the euro zone's second largest economy, saw its index slip to 48.8 from 50.1 in September, while the new orders sub component fell to 45.3 - its lowest since the survey began in May 1998. With the new order index for manufacturing also hitting a series low - it fell to 34.7 in October from 37.5 in September, all the indications are that tough times lie ahead given the extent of the worldwide economic slowdown. 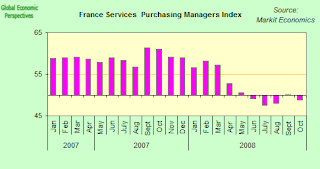 According to the latest estimate from France's national statistics office INSEE, the French economy contracted in Q3 2008, if that is the case I am left asking myself which of the big four eurozone economies could possibly be expected to have expanded in the July to September period. Certainly not the Spanish one, which while not technically in recession yet (you need to consecutive quarters of negative growth to classify as being in recession) can hardly have expanded. 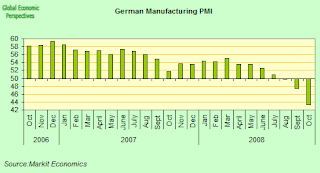 The German economy almost certainly contracted, and while the Italian one could sneak a surprise "horses-nose" expansion (given the low level it had reached in the 2nd quarter) I think it is unlikely. So here we go - recession in the eurozone. France's gross domestic product probably shrank by 0.1 percent in the third quarter after a contraction of 0.3 percent in the three months through June, according to the latest Insee estimate. The economy is also likely to shrink 0.1 percent in the final three months to cut growth to 0.9 percent for the full year, the slowest pace since 1993, Insee added. "Unfortunately nothing here indicates that we've hit bottom," said Chris Williamson, chief economist at Markit. "The availability of credit is definitely becoming a problem and if that doesn't turn around quickly then output numbers will probably follow those order book numbers down." Both Italian Business and Consumer Confidence fell back in October. Between the battering the Italian banking sector is taking on the one hand, and the ongoing contraction in the real economy on the other, Italy isn't exactly in the best of shape right now. Unfortuantely, despite years of warnings little was done, and now all the chickes come home to roost, and, as if in an illustration of what the expression "worst possible case scenario" means, they all come home to roost at once. Italian business confidence sliiped to its lowest level in 15 years in October while consumer optimism eased back as the global financial crisis darkened the economic outlook and offset the positive effects of cheaper oil prices. The Isae Institute's business confidence index fell sharply to 77.7 from a revised 81.8 in September, according to the news release from the Rome-based research center earlier this morning (Friday). Consumer confidence also slipped nack, falling to 102.2 from 102.8. Interestingly the drop in consumer confidence is not as sharp as that in business confidence, and we are still above the July low point (when oil prices hit a maximum), but the outlook for Italian households can scarcely be better than that for Italian corporates at this point. Perhaps the financial news just takes longer to sink in, while the impact of falling oil prices is pretty immediate, at least on the consumer outlook. Even before the outbreak of the latest round of financial turmoil Italy's economy was in all probability in recession after contracting 0.3 percent in the second quarter. Confindustria expect the Italian economy to actually contract in whole year2008, while the Isae Institute recently cut their own forecast for Italian growth, saying the economy would stagnate this year (ie neither expand nor contract), putting in the worst performance since 2003. In the short term things can only deteriorate from this position as the growing shock from the financial sector continues to pound the Italian real economy. Spanish unemployment hit a four-year high in the third quarter of this year as tens of thousands of jobs are lost every month as the decade-long housing boom comes to an end. According to data published today (Friday) by Spain's National Statistics Institute, the jobless rate rose to 11.33% in the third quarter from 10.44% in the second quarter. Lest we get confused here, there are two different systems for collecting data, one a monthly labour survey (based on interviews) on the basis of which the quarterly reports are prepared, and which go into the National Accounts (for GDP measurement purposes) and the monthly report from the Labour Office (or INEM). In some ways the latter give a better day to day comparison of the evolution of jobless trends, and the next one of those will be out at the start of November. According to the September INEM report the number of people out of work in Spain rose to an 11-year high in September, and this was the sixth consecutive month which has seen an increase. The number of job benefit claimants rose by 95,367 in September, up 3.7 percent from August, to 2.6 million, the highest since May 1997. This was considerably above what many analysts had been expectating and the trend is likely to continue. Personally I don't think there can now be any doubt about it, what is likely to become the longest running recession in Spanish history started on 1 July 2008. That's a historic date now. Make a note of it somewhere. For your grandchildren, perhaps. In their accompanying statement, INE said that 78,800 jobs were lost in Spain during the three months to Sept. 30. The INE also said 164,300 jobs had been lost since September of last year, and this was the first time the total number of jobs had declined on an annual basis since 1994. Until the financial crisis began in August of last year, Spain had been one of Europe's engines of economic growth and job creation. Largely thanks to a massive home-building boom, the eurozone's fourth largest economy created over a third of all new jobs (and consumed more cement than any other single member country) in the single-currency area over the last decade. 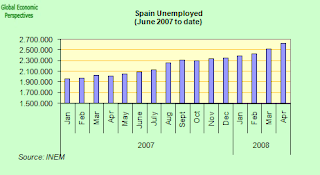 This boom allowed Spain's historically high unemployment rate to fall to just under 7.95% in the second quarter of 2007. But as the housing boom has slowed (from January 2007) and then collapsed following the onset of the global financial crisis all this has changed. With home sales and new home starts now in free fall, the INE said 354,000 construction sector jobs were lost in the third quarter from the same period a year earlier. According to internationally comparable monthly data released on Oct. 1 by Eurostat - the European Union's statistics coordinator - Spain had an 11.3% unemployment rate in August, the highest among the European Union's 27 member countries. Hungarian Prime Minister Ferenc Gyurcsány announced yesterday (Wednesday) that the government had reached an agreement with commercial banks intended to protect the interests of those who have taken out foreign currency loans. The situation is in fact a little bit complicated, since (unless there is some part of the fine print which has not been made public yet) we have to assume that the conversion rate be the going market one, which will mean that many of those who such mortgages will take some form of capital loss on the transfer, which can thus only be seen as some form of "late in the day" protection against subsequent falls in the value of the forint. Jiri Stanik at Wood & Co estimates that most bank clients took out their FX loans at a level of around CHF/HUF 170, so despite the fact that the forint has depreciated by some 30% against CHF over the last two months, its current level (HUF/CHF is about 185 at the time of writing) only represent s an 8/9% depreciation from the average client purchase price. 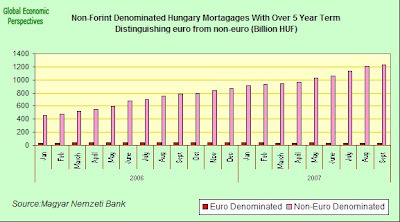 Most of the risk and all the really bad news will come for these mortgage holders if the forint were to continue to depreciate further against CHF. Will this depreciation continue? Well, even we economists don't really know the answer to that question, and certainly Hungarian householders have no idea at all, which is one very good reason why most of these clients may decide to get out now. Ceraintly they will probably be uncomforable with the realisation that they have suddenly all become day traders in the forward HUF/CHF swap market using their homes as security. "Herd behavior occurs when people do what others do rather than rely on their own (incomplete) information, which might be suggesting something different (Banerjee, 1992). The suppression of private information could lead to “information cascades” when decisions are made sequentially and a large enough number of people choose identical actions. In such settings, the decisions of a critical few people early on are enough to tilt group behavior toward a certain direction. Mimicking the behavior of others might be rational because of uncertainty about one’s own information as well as the need to economize on information-gathering costs. Rational herd behavior is the subject of a recent strand of behavioral finance (see Montier, 2002, for an introduction). " Well, given what I am saying above about the rapid and imminent demise of foreign exchange loans among Central and East European nationals, it is clear that the topic which is now about to come back into fashion (and to replace the forex loans themselves as the centre of attention - at least among theoretical economists) is that of the so called "balance sheet consequences" of excessive forex leveraging, so to give people some background, and a bit of a push start, I have hastily compiled a brief reading list on the topic.